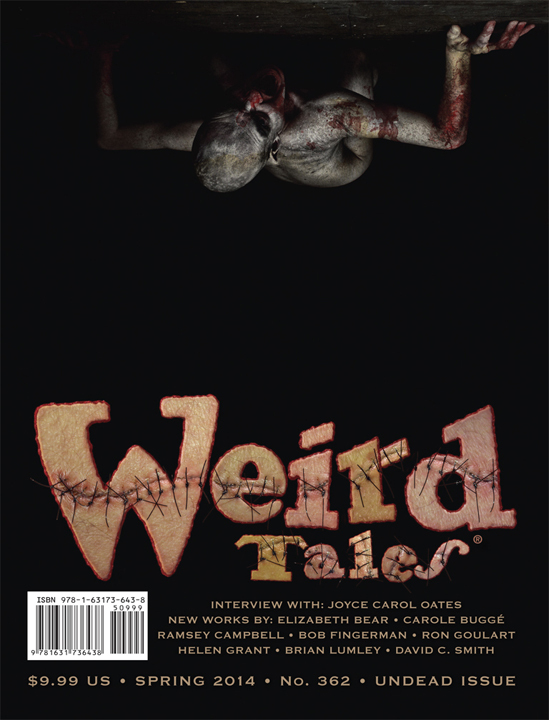 Black Gate » Articles » Weird Tales 362 on Sale Soon! Weird Tales 362 on Sale Soon! Our roving correspondent — and new Online Editor for Weird Tales magazine — Douglas Draa reports on the latest issue of the world’s oldest (and arguably greatest) fantasy magazine. Weird Tales magazine and Nth Dimension Media are pleased to announce the pending publication of the Spring 2014 issue of Weird Tales magazine. Continuing the successful concept of themed issues, #362 is our unsettling, but entertaining, Undead issue. And as always, there is also a sizable amount of un-themed fiction included in this issue. Issue #362 contains a mixture of themed and un-themed weird fiction and poetry along with sprinkling of non-fiction. Some of the Contributors to Issue #362 “Undead Issue,” along with many other talented writers, are Ron Goulart, Ramsey Campbell, Brian Lumley, Darrell Schweitzer, Jane Yolen, M. R. James & Helen Grant, and James Aquilone. This issue also contains an exclusive interview with Joyce Carol Oates, and a new short story written for Weird Tales by Minimum Wage comic book artist, Bob Fingerman, whose work influenced Walking Dead creator, Robert Kirkman. The front cover art is by Danielle Tunstall with a Richard Matheson tribute painting on the rear cover by Jeff Wong. This is the third issue produced by Nth Dimension Media, under new editor Marvin Kaye. We’re told the issue has gone to the printers and will be on newsstands (and in subscribers mailboxes) in the very near future. We have an electronic reviewer’s copy in our hot little hands and we’ll be reporting on it shortly. In the meantime, here’s a peek at the complete table of contents. Weird Tales is edited by Marvin Kaye and published by Nth Dimension Media. This issue is 120 pages, priced at $9.99 for the print edition and $6.99 for the digital version. See the complete Table of Contents here and purchase back issues here. We last covered Weird Tales with issue 361 in July of last year. Single copies are now available at Amazon.com! So they are! Thanks for letting us know, Doug!